Do you know what you’re wearing for Halloween? Or, more importantly, what your dog is wearing? The clock is ticking! Better make a decision soon! There are plenty different styles to choose from that could easily match your dog’s personaltiy. Does your dog love watching the Wizard of Oz with you? 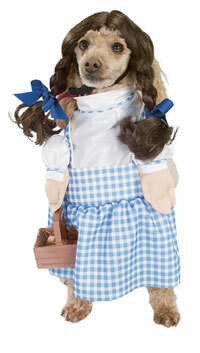 Why not dress her up in this lovely Dorothy costume? It includes both a dress and a headpiece, and even has the basket. Make sure to take her down the yellow brick road for Trick or Treating! It comes in all sizes, from Small to Extra Large. Is your dog goofy? Then this Spongebob costume is perfect! It’d be really cute if you dressed up as Patrick or Squidward too. 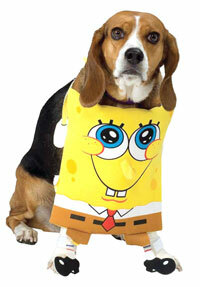 It fits around the neck and the paws, and is an officially licensed item from Nickelodean. It comes from sizes Small through Extra Large. Is your dog wise? 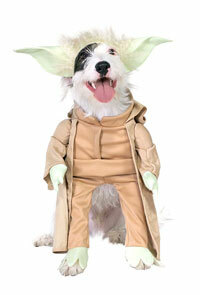 Why not a yoda costume? You could easily match it with a Darth Vader or Luke Skywalker costume, depending on your personality and relation to your dog, of course. It is a head piece and jump suit with attached arms, and is an official licensed Star Wars product. It comes in sizes Small through Extra Large. Is your dog the king? Or just a rock star? 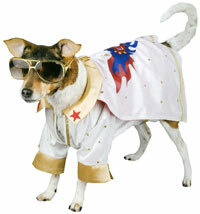 An Elvis costume fits just fine! If your dog wears this, make sure to bring around a karaoke machine or tape player with some Evlis songs to help it out. It is a cape with arms and cuffs. It has the initials EP on the back too. It comes in sizes Small through Extra Large. 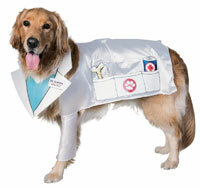 If your dog loves going to the vet, or is always there for the rescue, why not dress it us as a doctor! It is a cape with legs and a bib. It comes in sizes Small, Medium and Large. Is your dog very cartoonish, or always on secret missions? 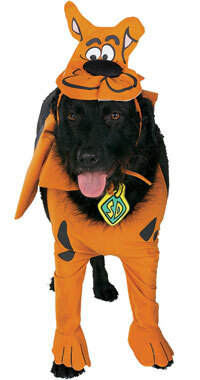 Scooby Doo is a great costume for such personalities. It is licensed by Scooby Doo, and comes in X Small, Small, Medium and Large. Make sure you have someone dressed up as Shaggy, Velma, Fred or Daphne, and drive around in a crazy psychadelic mini van! 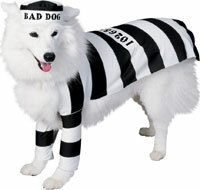 Bad dog? Don’t put her in a time out, put her in a prison costume! It is a black and white cape with sleaves and a complimentary cap. It comes in Small, Medium and Large. Is there any way I can order the scooby doo costume?